This is the second of seven "Peterkin Pottle" stories written and drawn by John Stanley. Western Publications' editorial department had high hopes for this original creation. It knocked the titular, licensed characters off the cover of their own magazine. 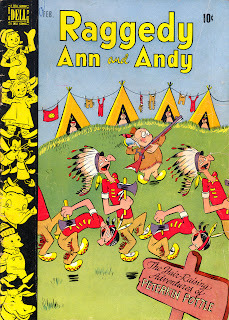 Raggedy Ann and Andy was one of many Dell Comics anthologies, but it was a very different magazine pre-Pottle. RA&A was the softest of Dell's comics, filled with long text pieces, gentle moralistic material and very un-John Stanley comics. 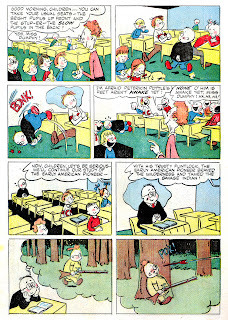 Its editors and contributors tried to be respectable--to soothe and please post-war American tots--to a fault. What a jolt "Peterkin Pottle" must have been to this gentle-as-a-lamb readership! John Stanley opened a personal floodgate of dark feelings and themes with this series. His depictions of childhood cruelties--and adult indifference--are unusually harsh and real. 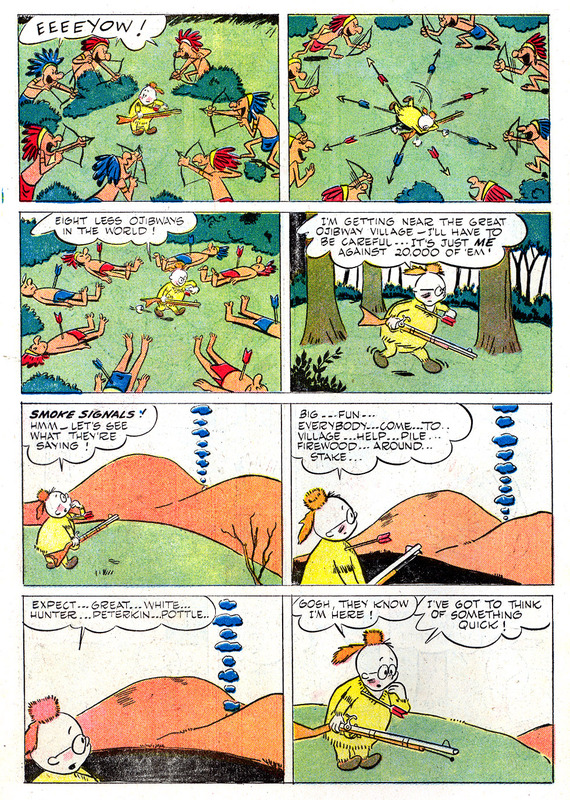 This was the first "Pottle" story I saw, back in those dark days before the advent of .cbr and .cbz files (and their ready-for-sainthood scanners and assemblers). Pete Dillon loaned his copy of this comic to me, by mail, in 2001. 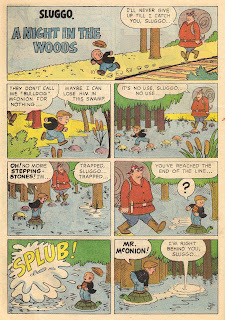 I scanned it for use on the original version of the Stanley Stories website. Despite my excitement at finally seeing "Pottle," the story left me cold. 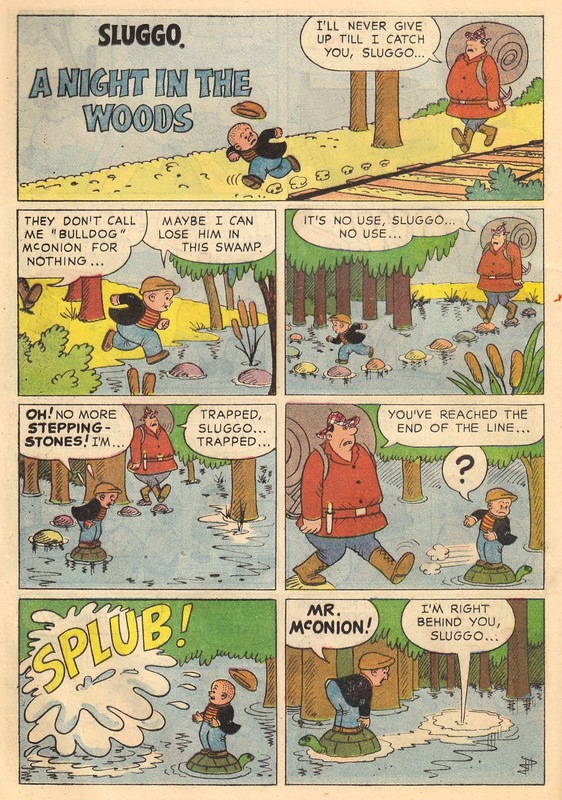 It is still my least favorite of the "Pottle" stories, despite its sharp comic timing and appealing artwork. John Stanley's sense of absurd humor, and his regard of the world around him, generally comes from a dark place. I accept that, and generally celebrate it. Stanley's ability to juggle with dark and light, and to find refuge in the million shades of gray between the two, is the essence of his unmistakable gift as a storyteller and cartoonist. 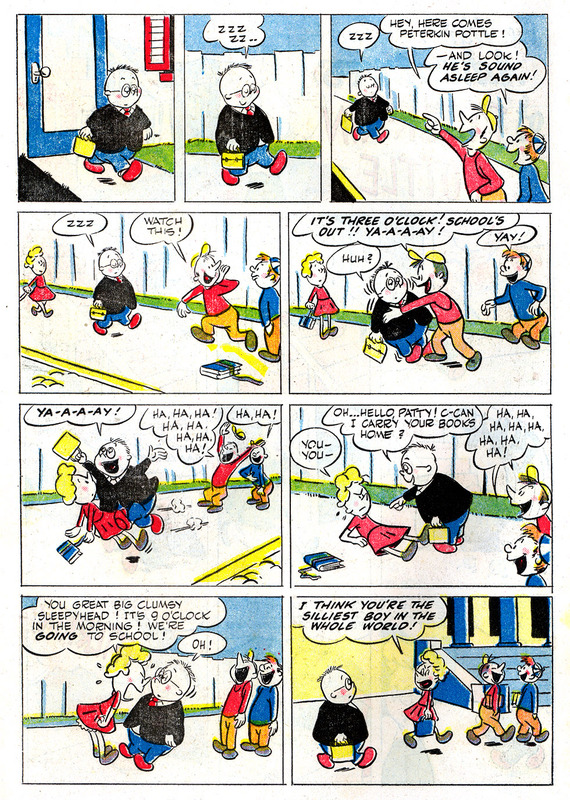 Darkness leaks into the Little Lulu universe. It's a major ingredient in the believability of those stories and their cast of characters. The Lulu world has gravity, and characters' actions (and reactions) have consequences. Theirs are typically comedic calamities, centered on the peer pressures and concerns of childhood. 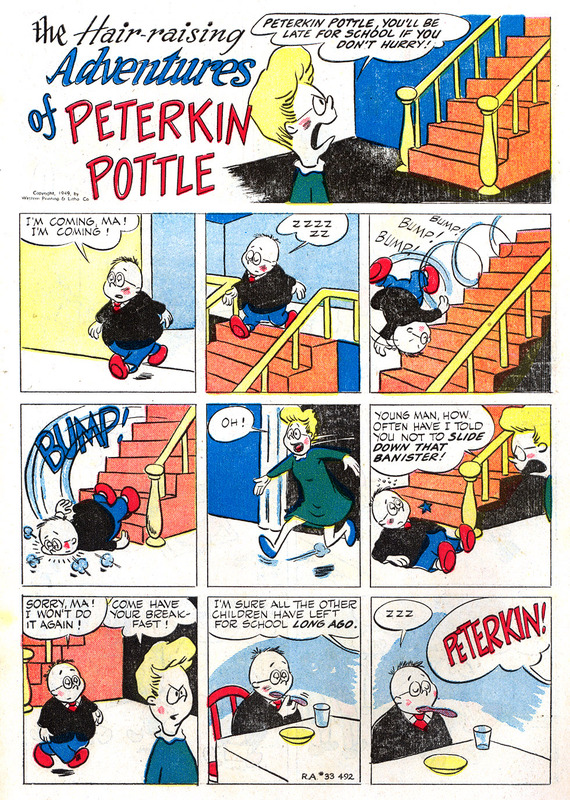 In general, Stanley kept the darker vibe of "Peterkin Pottle" out of Little Lulu. It surfaces most tellingly in the improvised fairy tales, as told by Lulu to her next-door neighbor Alvin. 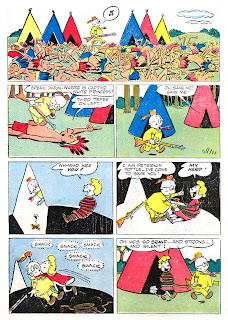 It is present in the "real world" stories of Lulu: in supporting characters such as McNabbem, the egocentric truant officer, the menacing West Side gang, and the representative of Stanley's Evil Rich, Wilbur. Sometimes Lulu goes farther into the black. In stories such as "Hide 'n Seek," the children encounter a clearly unbalanced, unsocialized adult outsider who poses a genuine physical threat to them. 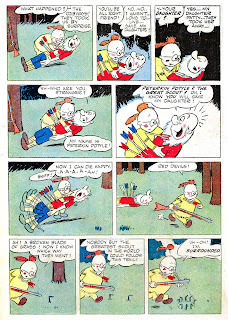 Overall, Stanley keeps the battle between bleak and bright balanced enough, in Little Lulu, to assure the series had an appealing tension. In early issues of the satellite Tubby quarterly, Stanley more indulged his dark side. Without Lulu, he was much freer to use higher narrative stakes and more imaginative themes. 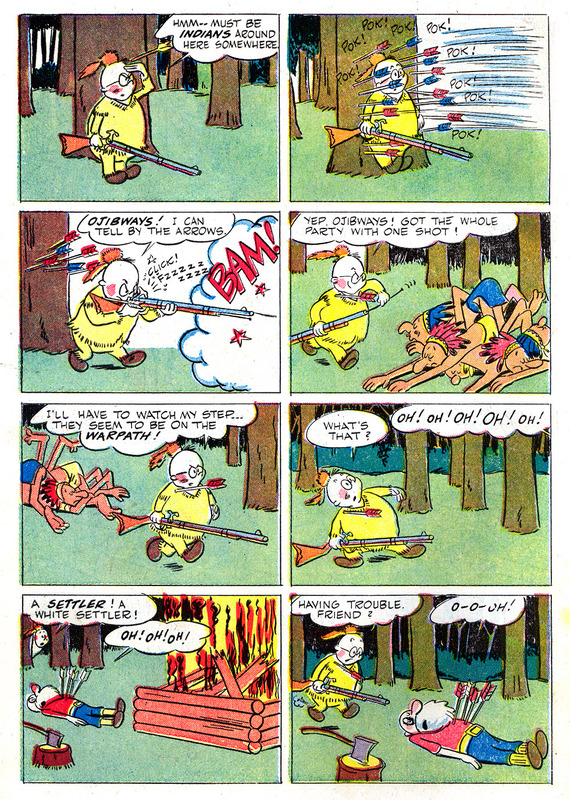 Tubby is often in peril, in these early issues (most of them tellingly illustrated by Stanley), but he is a confident, pro-active protagonist. He is never consumed by the world's tribulations; he is also too self-absorbed to notice fate's more glancing blows. These encounters are played for laughs, and are accomplished pieces of black comedy. Yet they leave a bitter taste in the reader's mouth. This sensation is at the foundation of "Peterkin Pottle." I've written several times about this feature elsewhere on Stanley Stories. I hesitate to repeat myself further, except to note that this story pushes the limits of cruelty and violence farther than any other story in Stanley's canon until the Melvin Monster series of the mid-1960s. Stanley's cover illustration contains a curious cut-and-paste pattern. 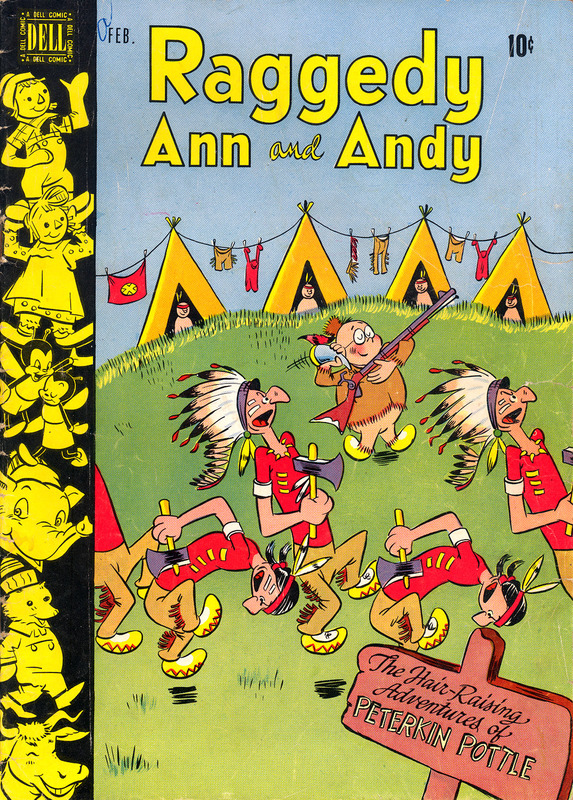 This noticeable repetition of the Native American figures sets the mood for the remarkable story ahead. There are brilliant moments in this second "Pottle." Stanley evokes the cliches of the frontier Western in 1940s mass media as he thoroughly skewers them. This is no specific parody of a recognizable movie or book. As with all the "Pottle" stories, the target is an entire genre. Painted in broad strokes, the spoofing of this series might potentially be more akin to The Carol Burnett Show than to Harvey Kurtzman's Mad comics. Stanley's keenly honed wit makes these daydream sequences among the best of his writing. That said, Peterkin's wholesale slaughter of Native Americans is a bit hard to take, 61 years after the fact. Like the frequent spanking scenes in Little Lulu, this burlesque of slaughter, though not intended to disturb, are as stark as anything in Kurtzman's E.C. 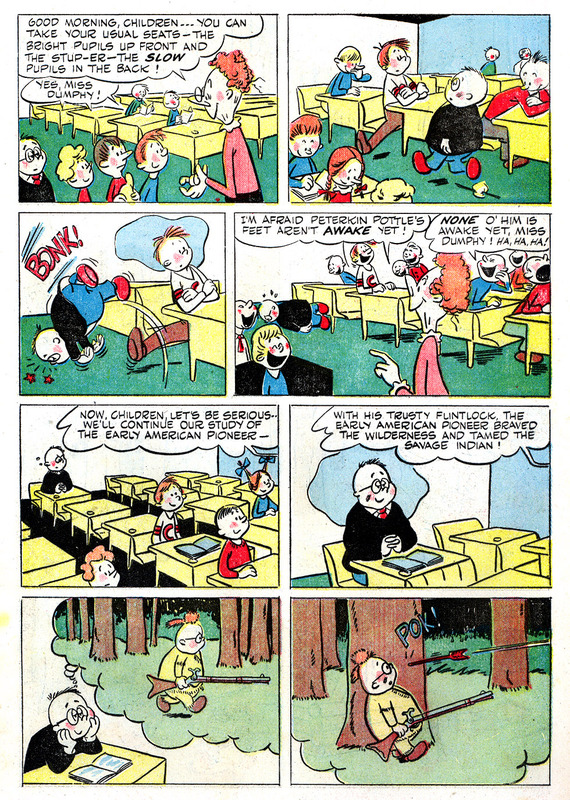 war comics of the 1950s. This story's "real world" wrap-around has a particularly bleak world-view. Peterkin is nearly narcoleptic here--unable to come downstairs for breakfast without passing out. He takes a vicious tumble down the stairs, is verbally berated twice by his harridan mother, and then sets out for school. "I think you're the silliest boy in the whole world!" 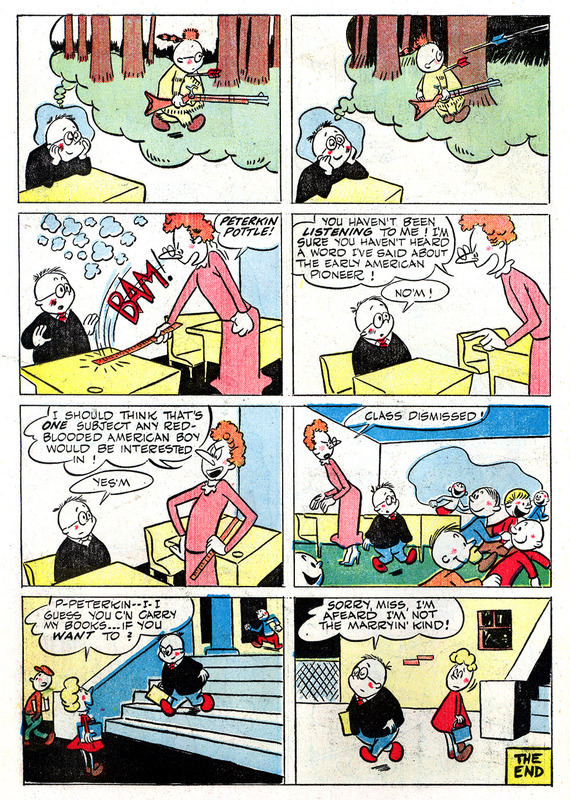 Page three finds Pottle in the classroom. His teacher, a twin for his unloving, judgmental mother, declares him to be "stup- er, slow" and sends him to the back of the seats. On his way to the shame spot, a classmate trips Peterkin and causes him further embarrassment and mockery. Peterkin betrays no affect from the world's mistreatment. It doesn't seem to move him one way or the other. He soon drifts into a dream, in which he is admired, feared, capable and infallible. This fantasy is also full of death and slaughter. Though it's not openly stated, it's implied that Peterkin gets his rocks off on these fantasies of murder, oppression and superiority. 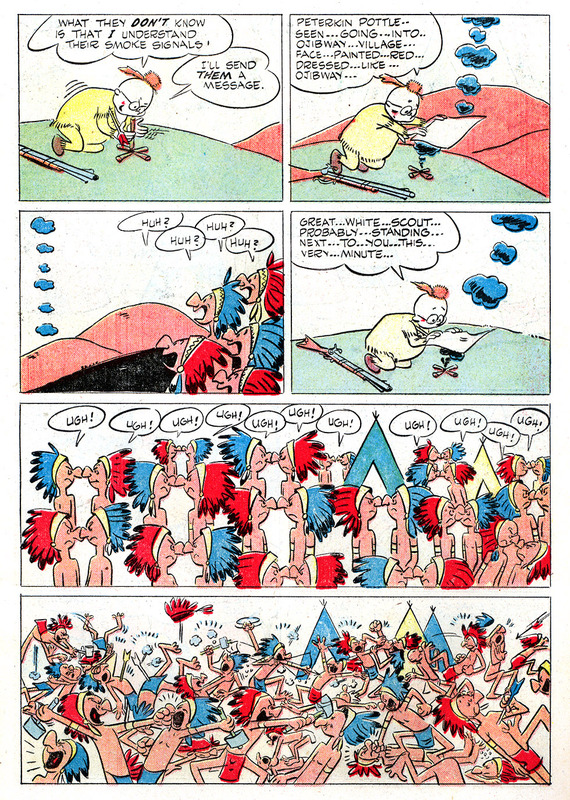 He engineers a smoke-signal campaign that causes a tribe of Ojibway to suspect one another of being a spy, and apparently results in a mass konking-on-head, if not something worse. 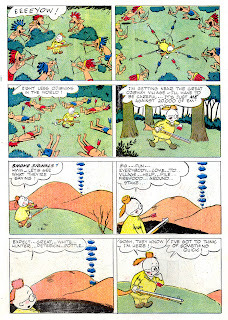 The long panel, on the top of p.8, is among the most chilling images in the history of comics. I don't think it was meant this way, but it is nonetheless. Peterkin displays more connection to his farcical fantasy world than he does to the grim gauntlet of his daily life. He is able to do anything, and be admired by his allies and feared by his enemies. As well, he gets the girl (who is always Pam) but rebuffs her advances. Here, he does so in perfect parody of Western-movie tropes. 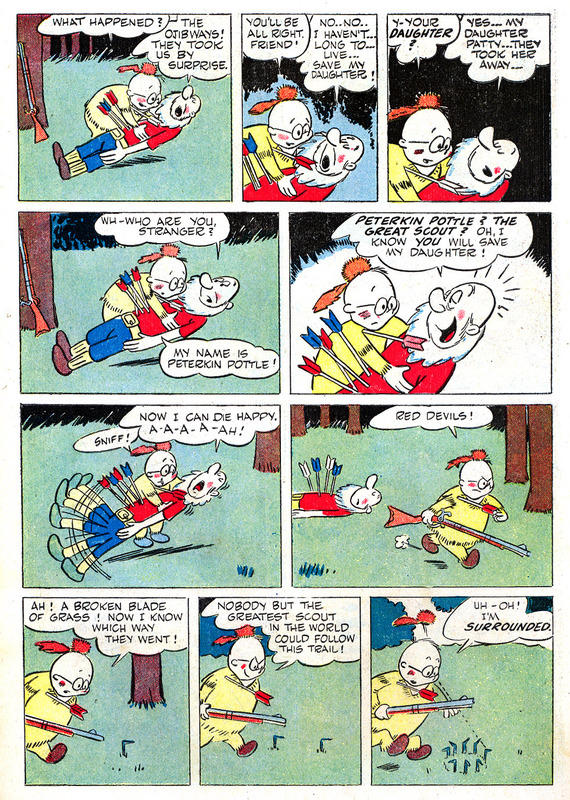 Just as Peterkin is felled with a stray Ojibway arrow, Miss Dumphy's ruler shatters his fugue state. Her harsh awakening returns Pottle to his awful truth. He's a disempowered schlub who will probably never do better in his life. In the story's bittersweet finale, Pam takes pity on Peterkin and fulfills his earlier request to carry her books. Pottle refuses, in the manner of his fantasy-self. He finds the last crumb of his dignity and plods homeward, where more parental disdain awaits him. As said earlier, I do not shy away from the darker edges of John Stanley's world. I fully believe that this darkness gives his work a sense of literary permanence. Like any creator, Stanley made mis-steps and pursued concepts that didn't work. 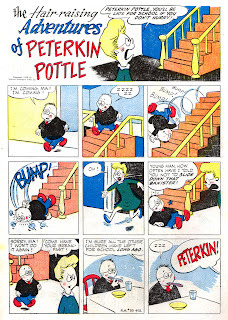 "Peterkin Pottle" is the beginning of a great idea--one that anticipates Roald Dahl's writings about childhood, and a strong attempt to bring more of a sense of real life to children's comics. 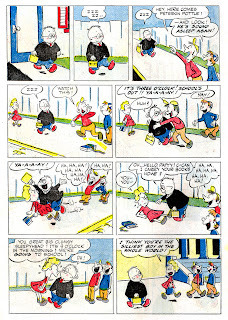 Had Stanley been given another year to continue "Pottle," he might have gotten his ideas in focus--much as he did with "Little Lulu" and "Thirteen Going on Eighteen" in their first years of comic-book life. But this series was abruptly killed just at the crucial point of focus. There is still much to learn from Stanley's failures. 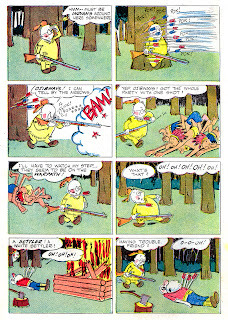 And although the cruelty and violence of this story may be a bitter pill to swallow, there are rewards in Stanley's approach--and in his unusual depiction of the shittiness of childhood. This realistic decision went 100% against the "official" mainstream media vision of kid life. 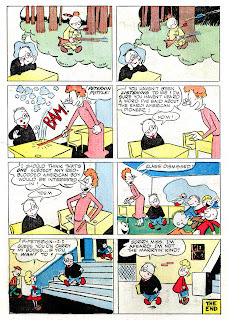 Even in Stanley's take on "Little Lulu," the tribulations of childhood are never overwhelming. 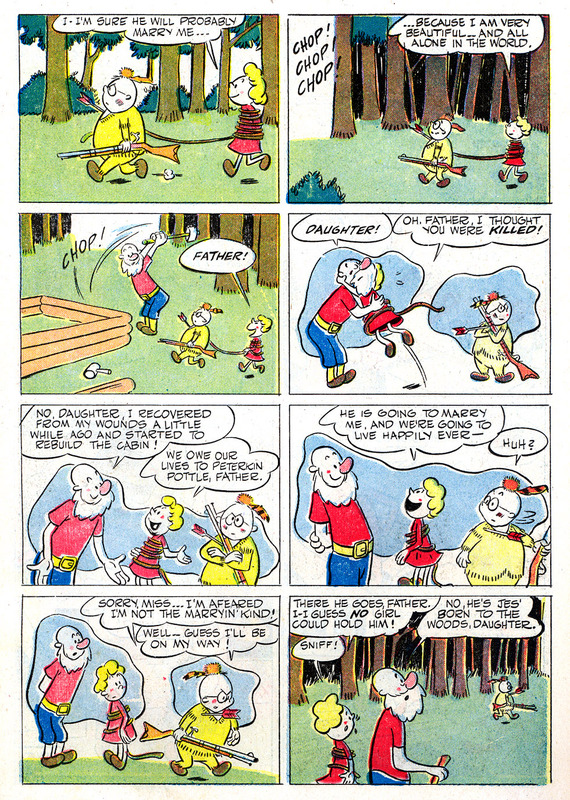 Lulu, Tubby, and th' gang have supportive parents, teachers and friends. They are never alone. Even the ego-maniac Tubby is never truly isolated from the outside world. Stanley's Lulu, charming and rewarding as it is, is much more in line with the mainstream reassurance that childhood is sweet and safe. There is just enough bitter mixed into the formula to give the stories lasting oomph. I haven't yet encountered anyone who read the "Pottle" stories when they were new, but I'd imagine that they made an impact on more sensitive, less socialized children. 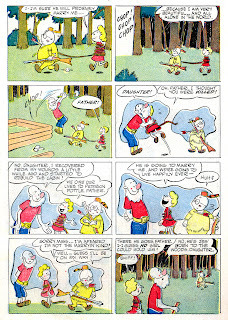 "Pottle"s basic formula was revived in the 1960s for the American Comic Group's oddball masterpiece, Herbie. 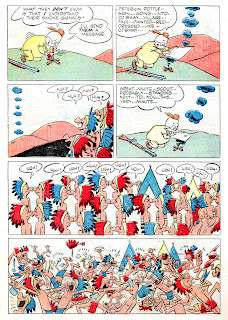 I briefly noted the similarities of "Pottle" and Popnecker HERE earlier this year.